I swear I twittered about you right before this blogpost came up. lol I'm not sure I'll use the review thing, but I like following you guys on twitter! Love this idea. The more integration you can do on Twitter, the better! Keep 'em coming! Uncanny! I had just posted a query in Talk about this because having recently become a Twit I seem to notice all things Twitter now, and I wondered what it did. It's great — I've already Tweeted one of my reviews. So, is there any plan for similar facebook integration? We hate Facebook. Didn't you get the memo? Yeah, I guess I did sort of realize that when two years passed and there's still no sign of a Facebook app…. Please make it possible for those of us who do not use Twitter to remove that bright annoying icon from our reviews. You may hate Facebook (I have no opinion thereon), but some of us hate Twitter. Don't know how I had missed this post but I love this new feature. I will use it a lot. Missed this post earlier, but I think this is a handy feature. 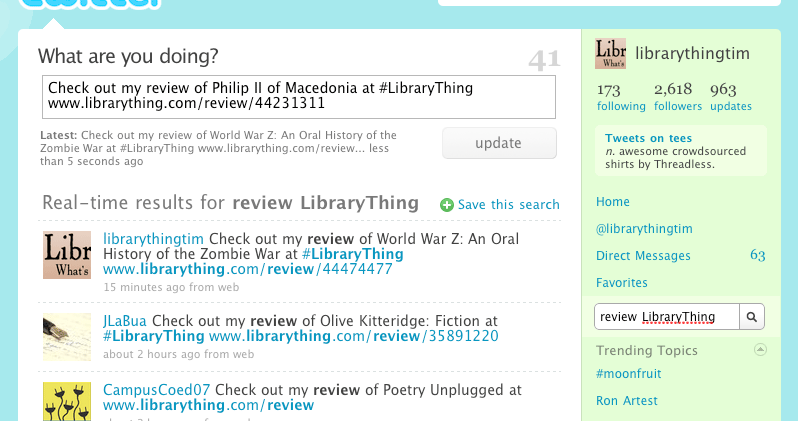 I really like the ability to use Twitter to send books to LibraryThing — I have written about this and tell people about it all the time, but I find people don't get it until they actually try it, and see the magic happen. And get back a message with links to a few recipes with those ingredients, plus a link to the search results page on RecipePuppy. I would love to be able to send a title or ISBN to LibraryThing and get back links to suggested titles. Not that I think the gang at LibraryThing is likely to run out of ideas any time soon! Missed this post while on holidays. This is a a fab feature. As I'm not a great reviewer I'd love to to be able to tweet from LT when I just add, tag and rate a book……and then I could tweet my LT posts to Facebook :-)) Are there plans for this? Alternatively I'll be forced to write very short reviews.